Jack Butala: Welcome to the show today. 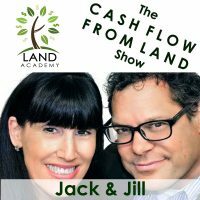 In this episode, Jill and I talk about buy and lease disasters. Jack Butala: Why would you put disaster in a title, Jack? Let’s find out. Before we get into it, let’s take a question posted by one of our members on the landinvestors.com online community. It’s free. Jack Butala: I like where this is going. Jack Butala: Right. I have to interrupt here for a second. Jack Butala: I say it a million times, I’m going to say it again. I cannot believe the level of intelligence of our members. Jill DeWit: Oh yeah. It’s true. Jack Butala: Thank you, Bryan. Thank you for showing up and taking this seriously. I mean it. This is fantastic question, and I can tell by the way you’re writing it out you’re going to do well. Jill DeWit: Thank you. Can I go now? Jack Butala: Yeah. You mean leave the show? Jill DeWit: Yeah, I know. Can I finish? Jill DeWit: I know what mine is. Jack Butala: We have the same thought. Go ahead, Jill. Jack Butala: D. I’m going to give you a D option. Jill DeWit: Oh, D? I’m with C. A D, keep your head down. Jack Butala: This is what Jill and I do. Jill DeWit: Don’t talk to anyone and just do it. That’s my usual answer. Jack Butala: That’s good advice for everybody. Just take the pain. Jill DeWit: Just don’t draw any attention to it, you’ll probably slide right by. Jack Butala: In with the crowd, out with the crowd. Jill DeWit: Yes. Don’t ask for permission. It’s all good. I [inaudible 00:03:15] one of my parents were like, “[inaudible 00:03:16] Jill. Really? What?” Go ahead. Jack Butala: By the way, all traffic laws do not apply to Jill. Jill DeWit: Oh no. I’m exempt. My dad told me that one. Jack Butala: Here, here’s option D. Respectfully, you’re spending way too much time on this one little piece of property. What we say is, we bought this property for way, way less than it’s worth, and we’re going to sell it to you for less than it’s worth retail. So we didn’t check into it. I’m not sure. But you, the end user, and the person that Bryan’s selling it to, if you’re the end user and this is a concern for you, then I really encourage you to check it out. Because I don’t know the answer. And I’m not your parents. I’m not going to cut your food up. You’re old enough to check out the easements yourself, and check it all. And I had it priced that way, by the way. I’m not saying I’m going to price it retail, and give you no information. But I’m going to price it way below wholesale. In exchange for that, I really need you to go find out whatever it is that you’re concerned about. Might be well, might be water, might be utilities, might be easements in this case. Jill DeWit: They’ll figure it out. Jack Butala: … I would sell it for less money to the person who’s more silent. Jill DeWit: Right. You know what, we have had that conversation, you’re right. That is the best answer. Because I have said, “Well, if you really want, for the right price, I’ll go out and pave it for you.” Seriously. Jack Butala: Pave it in gold. Jack Butala: I’m happy to pave it in gold for X.
Jill DeWit: If you’re willing to pay for that, and I have had … one time I had a guy that wanted it staked. I said, “Well, here’s the deal, you can go out and find someone and they can walk the property, and stake it and all that good stuff for you. Or, I can do it too, but I can guarantee it the way it’s priced now, it’s better off if you do it.” And they [inaudible 00:05:21], “Oh, got it. Thank you.” And they look it up and they know it’s true. I’m not just saying that. That’s part of why it’s priced this way. Like you just said Jack, that’s it. I’m not doing all that. Jill DeWit: And you win. Jack Butala: … grab four pieces of wood, and tie them with little cute ribbons, and get a GPS unit, and go out and stake the property and drive them in. And then you’re staked, too, and you save yourself two grand. Because that’s all the surveyor’s going to do. Jill DeWit: We didn’t even have that back then, too. Jack Butala: All kidding aside, this business model works great when you don’t get into the details. Not the details of sales. You need to get into the details of data and pricing property times 80. But when it comes to take my hand and hold my hand and lets find out … forget about all that. Jill DeWit: That is not the conversation you ever should be having with your buyer. Jack Butala: Just move to the next deal, and move to the next buyer. Because that’s the beauty, all kidding aside, of buying property for half of what it’s worth. Jill DeWit: And I hate to say it, this is our business. We’re wholesalers. We’re not here selling to the end user. I’m not going to spend that much time. I want to move the deals and move on. And that’s it. We’re here for quantity. Jack Butala: So think of two ’65 Mustangs. Two classic cars, and they’re sitting right next to each other. One of them is completely done, and the owner is going to throw you the keys but he wants 30,000 bucks. And you’re going to put the top down, turn the key, the engine’s going to go, and you’re going to be the envy of all your friends. People are going to chase you down the street the car’s so beautiful. Old bald men, by the way. Because those are the people that are interested in that car, not young pretty girls. And the second car, the thing’s falling apart and he’s throwing you the keys and it only costs 5,000 bucks but there’s a ton of stuff to do. You’re probably a good six to eight months away from having that what I just described a couple seconds ago, driving down the street and being the envy of everybody. What’s your personality type? Do you want to spend 30,000 or 5,000? I’m a $30,000 person when it comes to this, but in my business I’m a $5,000 person and I don’t expect … If I go to the $5,000 car owner and say, “Well, the brakes don’t even work on this car.” That’s why it’s $5,000. Jack Butala: That’s what’s going on here, Bryan. Jill DeWit: “The top’s broken.” No kidding. Jack Butala: You can’t have it all. You cannot have it all at the same time. You just can’t. Jack Butala: So if you want a half price property, there may or may not be stuff that needs to be addressed. Jack Butala: It’s not your job. Oh, sorry. Go ahead. Jill DeWit: No, you’re good. No, no. Jack Butala: I wasn’t quite done with my rant. Jill DeWit: I’m sorry. Keep going. Jill DeWit: This is Jack on DayQuil. Jill DeWit: Day two, Jack on DayQuil, and it’s getting funnier. Jack Butala: That’s why these shows are an hour and a half instead of 20 minutes. Jill DeWit: Yeah, what the heck? It’s hilarious. Jack Butala: If you have a question and want to be in the show, reach out to either one of us on landinvestors.com. Today’s topic, buy and lease disasters. This is the meat of the show. Recently I was reading, I think it was on Bigger Pockets or somewhere, where a young real estate investor was just pulling her hair out saying … They bought a house. Through probably no fault of their own. Well, they have to take responsibility for it, I guess. But bought a property with financing, got a tenant in there, the tenant stopped paying. This is a buy and lease disaster. When you buy a property, especially with financing a house, and you rent it out to somebody, there’s about 4200 things that can go wrong. As a real estate investor … what was yesterday’s show about? Look inside the mirror and be honest with yourself? Jill DeWit: Identify where you need help up front. Jack Butala: When you buy and resell a piece of land, there’s about three things that can go wrong. I would argue there’s actually nothing that can go wrong if you do all your homework. Jill DeWit: I agree. Buy in cash. Jack Butala: Why do this to yourself? Why buy a house, with financing especially? Jill DeWit: So many things. Jack Butala: There are literally infinite number of things that can go wrong. Literally. From wallpaper falling down, to getting the right tenant, to overpaying and the foundation’s … There’s a million things, a ton of stuff that can go wrong. I don’t need to waste your time, listener, and describe the stuff … Just go on Bigger Pockets or on Land Investors and ask anybody if this is a good idea. In fact, you know what? Do that. You’re thinking about buying a house and renting it, and you think that you’re going to get a Ferrari in a couple of months later? That’s just not how it works. The numbers don’t [inaudible 00:10:46]. If you think that you’re going to buy a 500 unit apartment building and get a Ferrari six months later, that’s just not how it’s going to go. That’s 500 more problems that you’re going to have, in my opinion. Instead of just one. Jack Butala: I would really consider, even if you do this successfully, expand your real estate horizons to purchasing and wholesaling out property of all kinds. We have a very successful member who buys and sells, using our methodology here, apartment buildings and they’re killing it. Jill DeWit: Yeah, so buying these assets is not the crazy part, but it’s hanging on to them to lease them out, and try to get rich that way, is a long, long, long process. Versus, buy a bunch of them, flip them, and move on. Pay cash for them. That’s the first thing, too. The best thing is, have your buyer lined up. That’s the easiest thing out there. It’s not hard to find everybody who was looking for a certain asset. They’re there. If you just start looking, you’ll find them. It’s all over the internet. Driving around you see things. Find out what they want, go get them the asset, mark it up, you’re out no money, and you are on your way. Jack Butala: If you’re a manufacturer and you need a part, like a component to whatever you’re selling and you just don’t want to make the part, it’s too complicated, but you sell a little piece of machinery or something, what do you do? You go out and you submit an RFP, or request for proposal. You look at all the people that manufacture these types of parts and you pick the one that’s the best fit. Real estate should be, I don’t know why it’s the other way around, but it should be no different. If you’re a house flipper, not us, we’re wholesalers, you should be able to say, “You know what? I need a part. I need a house to flip, and I don’t want to pay a lot. I want the best situation.” So you just fill in an order. It’s really, really, simple. Jill DeWit: Yeah, especially … I’m thinking back to your buy and lease disasters and how most people do it, when you really think about it … because I remember these. This is the numbers that my dad was doing. He was testing this once in Texas. He was buying in the Dallas area homes in the outskirts. $80,000, $100,000 homes. Leasing them up and he had ten of them. At the end of the day, because he was not paying cash for them, they were mortgaged, his profit was 100, 200 bucks a house. Jack Butala: Yeah, that’s a buy and lease disaster. Jill DeWit: … fixing a dryer, and he’s doing this. And then, my mom will talk about this lovingly and I’m being sarcastic here, because this is Dad’s crazy idea. And this is what everybody’s doing, because they think it’s a good idea. Dad would say, “Oh, don’t worry about that.” He’d buy the house, and he’s showing it to somebody. “Don’t worry about that. I’ll get my cleaning crew to take care of that.” Well, back then, the cleaning crew was my mom. Jack Butala: Oh, that’s awful. Jack Butala: Yeah, that’s where he made his money. Jill DeWit: Not the whole time. Jack Butala: … you don’t really make money unless you have no leverage at all. And then you have to really ask yourself some questions. Talk to any commercial real estate investor who’s successful, you make the money when you buy it and sell. Here’s a commercial real estate game, really quickly. You buy an apartment building, a 100 unit apartment building, and everybody’s paying $1,000 a month. So that’s $100,000 a month in revenue. You raise their rent. Immediately, you raise their rent 5 to 10 to 20%, so everybody’s paying $1,100 or $1,200 instead of 1,000, and you lose some. Some people just say, “You know what? I’m not paying.” And they move out. Very few, by the way. Everybody argues about it, and they forget about it two weeks later. Now the property, on a capitalization rate, is worth a lot more. That is how you make a tremendous amount of money in commercial real estate. You don’t buy it and hold it forever. It’s called a balance sheet acquisition. Jack Butala: And they’re my favorite kind. Jack Butala: Or sometimes, if you’ve got iron-clad leases with commercial tenants it goes up with the Consumer Price Index, or with inflation. So 3 to 5%. You just hold it. You know what your [inaudible 00:15:54] is when you buy it, and you got classic tenants like Starbucks and stuff paying and it goes up 3 to 5% a year, in five years that asset is worth a lot more and you sell it. That’s where the dough is. It’s not … you just hope that the rent covers. I wish I could scream this to the world. Jill DeWit: This is a good idea. Jack Butala: That it’s good to go buy a house and get a mortgage and rent it out. Jack Butala: Arizona or California? Jack Butala: Oh my gosh, I do remember this. Jill DeWit: It was so funny. One of them was laid off, and so she was still paying the bills from her day job. Jack Butala: Oh I do know. I remember this. Yeah. Jill DeWit: So he was going in doing all the renovating. They’re thinking this is a good idea. They have all this enthusiasm. Well then, a couple months go by and we see them at this party again. Jack Butala: I remember this. We should call them and have them on the show. Jill DeWit: It’s the funniest thing. The level of enthusiasm … “Well, this went wrong, that went wrong, and this took six weeks longer than we thought. We’re now out of money. We called our parents.” And then all the way through. And then at the end, I think either they moved in … I don’t know if they leased it out. They might have had to move in it, because that was the only option. Jack Butala: Fiery ball of tragedy. Jack Butala: You can make money. Jack Butala: We have another friend, his name’s Dennis. We sell a lot of houses to him. And I asked him why [inaudible 00:18:28]. Jill DeWit: There’s a few. Jack Butala: “What’s the difference between you and everybody else?” And you know what he says? Jill DeWit: Yeah. Can’t go wrong. Jill DeWit: That’s true. Yeah, you’re right. Jill DeWit: Making it beautiful. Jill DeWit: Yeah, Dennis is the [inaudible 00:18:52] amount. He sells them. So that’s a difference, too. Jack Butala: And he’s a real estate agent, so he really looks at the numbers. Jill DeWit: He does. He’s a numbers guy. Jack Butala: He cuts out as much as he can. He pays cash for everything. Jack Butala: No. Oh, let’s have a baby. Jill DeWit: Or let’s renovate a house together. Jack Butala: Yeah, let’s have a baby. We’ll get closer. Jill DeWit: That kind of a thing. We’re going to do this because we’re going to do this together, we get to spend some quality time together in Lowe’s. Jack Butala: Or Babies “R” Us. Jill DeWit: Here we go. Or both. Then I got pregnant during it. Isn’t this great? Could you imagine? That’s the show I want to watch. How come nobody does that kind of a show? We should do that. Jill DeWit: I want a show showing that they’re all excited, then somebody gets pregnant, and then they can’t pay their own mortgage. Jack Butala: Here’s the name of the show, Barefoot and Pregnant Renovators. Jill DeWit: Yes, that’s it. That I will watch. That’s the one I want to see. Jack Butala: Oh my gosh. We just lost half of the six people that listen to this show. Jill DeWit: I hope we just successfully dispelled some of the wonderful whatever, so you know that there’s a lot things that can go wrong. Jack Butala: Do yourself a favor and please consider buying a piece of property for half of what it’s worth and selling it for just a little bit more, over and over again. Join us in the next episode where we discuss putting yourself in charge. Jill DeWit: And we answer [Avery’s 00:20:36] question about using social media to sell property. Jack Butala: You are not alone in your social marketing ambition. Jill DeWit: Alright, jacked up Jack is awesome. Jack Butala: Really? I’m all hopped up on cold medicine. I just don’t have a care in the world. Jill DeWit: No, you really don’t. It’s kind of nice. I can’t wait until after 5:00. We’re going to hand a drink to you and see how that goes. Jack Butala: I’m just going to go straight to bed. Jill DeWit: Yeah, oh, that’s true. That’s what will happen. Jack Butala: Dad, you’re no fun anymore. Jack Butala: Come on, Dad. Jack Butala: You used to be fun. Jack Butala: What’s wrong with you, Dad? Jill DeWit: Love Jack? Like our show? Love jacked up Jack and love our show? Please subscribe and rate us on iTunes or wherever you’re listening.